Indeterminate sentencing and the prison regime. This research briefing presents research on the impact of indeterminate sentencing on the prison regime. 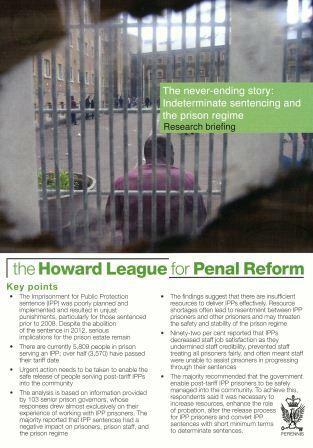 The Howard League worked with the Prison Governors Association to survey prison governors about the impact of IPP sentences. The briefing presents the survey findings, and includes a series of recommendations to enable the safe management of those serving an IPP sentence into the community.